1. Why is death a problem? 2. How can I be sure? 3. What will happen to my body? 4. What will it be like to die? 5. How do we cope with bereavement? 6. What will life be like in eternity? Another fantastic book from this series. When "life after death" and "what we'll come back as" came up over dinner with unbelieving friends they were quite struck by the certainty of my response that we can be raised to life AS OURSELVES but without any of the broken bits!! Possible because Jesus has done it! I was able to answer with confidence because of what I read here about what the bible teaches. Thank you. Helpful and reassuring as I have recently lost my Christian husband. Also helpful to pass to a non believer. The whole Christian teaching was clearly explained. Excellent. I wish this book had been around a few years ago when I was dealing with the death of a Christian loved one. I found it a hugely encouraging summary on the Bible's teaching on death and a big challenge to face up to one of society's taboos. I have already bought copies for believing friends and would recommend it. Why is death such a problem? What will it be like to die? How will we cope with bereavement? What will it be like in eternity? Should we pray for the dead? Soul sleep or with the Lord? Will we recognise loved ones? What is the soul or spirit? If you want to know the answer to any or all of these questions – then pick up this short, readable and well written book. The great strength of this book is that it marshals the evidence of the bible well to answer all of these questions. 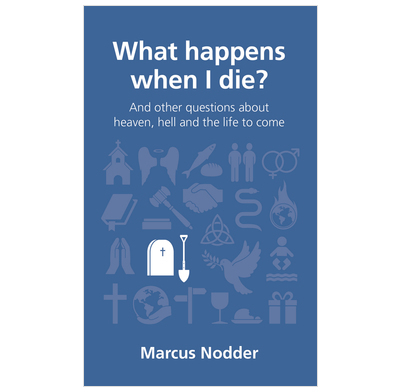 My conclusion is that I recommend this book to help you answer your questions about what happens when you die. I bought this book following the death of a close believing relative. I wanted a book to give to grieving relatives who were asking questions about what happens after death. Personally I found the book rather depressing, with its initial emphasis on hell more than heaven. I decided not to give it to the relatives but have spoken to them about heaven instead. I do not agree it was 'warm and pastorally sensitive' as in a previous review. Thanks for your review, and our apologies if the promotional description was less than helpful. This is not a book, or indeed a series for everyone. It is quite specifically aimed at believing Christians to explain in detail the Bible's teaching about death and what comes next. So it is much more full and detailed than a book that is aimed at recently bereaved and grieving people who may or may not be believers. We have other resources that are designed more specifically for use you had in mind - have a look at Hope to Carry On on our website. In the context of the book, it is very necessary to start with judgement, because that is the very reason that death exists at all. The Lord Jesus and all the other Bible writers are clear that there is Christian hope beyond the grave only for those who have put their trust Christ. what a brilliant book! Having read it, I immediately ordered 10 more copies to give away. It is clear, concise and suitable for Christians & unbelievers: free of jargon & Christian language, it is easy to understand, and pulls together teaching on what happens after death from many parts of the Bible. It addresses the questions people frequently ask, and gives simple straightforward answers. Very Biblical, warm & pastorally sensitive. The best book I have come across on this subject especially for friends not familiar with the Bible.